Hey guys! 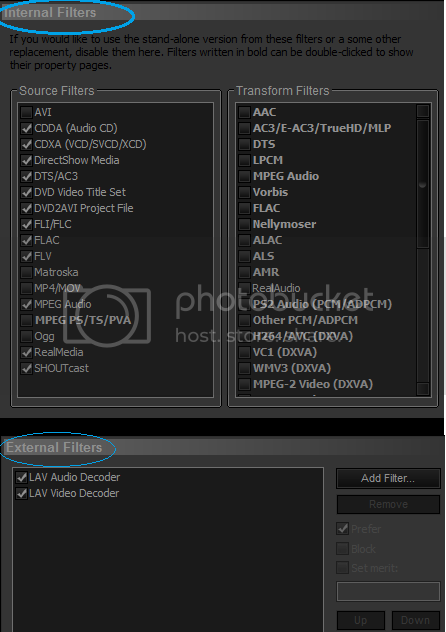 I'm doing a comparison for you guys on these three popular decoders for the H.264 codec. I have all three decoders installed on my computer, so I thought I might as well test it and see which one is the best. For the 480p to 720p upscale you can notice a slight difference with MadVR (more sharper) and while CCCP and CoreAVC looks the same. Wow I had a lot of issues uploading it to screenshot comparison >.> I hope you guys find this useful! Hopefully this will help you guys decide which decoder is the best to use. If you ask me, it doesn't really matter. It's all up to personal taste, since the difference between them is quite small in terms of quality. I'm sticking with CoreAVC for now (since it is a lot faster than FFDshow), but will use MadVR when upscaling. I'm keeping CCCP as well, because when I installed MadVR I didn't install audio decoders or any of those other stuff the MadVR needs since CCCP already offers them and I had it installed long before MadVR or CoreAVC. why code the links? you only must code links to file hosts. Out of curiosity, did you check to see if the codec packs weren't interfering with one another? You did say you had them all installed at once. You can configure MadVR to use different sharpening filters, which ones did you use in your screenshots? Also you're comparing Video renderers to Video decoders? Or did you solely compare CCCP's ffdshow video decoder to MadVR's video decoder and CoreAVC video decoder? Since I don't see how you can compare MadVR's video renderer to CCCP or CoreAVC which neither are video renderers. I suppose you're comparing MadVR to EVR? Lol sorry my bad, I was a bit tired, I suppose we don't need it. Yep =), and none of them were interfering, I just unregistered it through the settings or used MPC-HC to configure which decoder to use. I used the FFDShow Audio decoder for each one, but that does nothing to the image quality, so it's all good =). 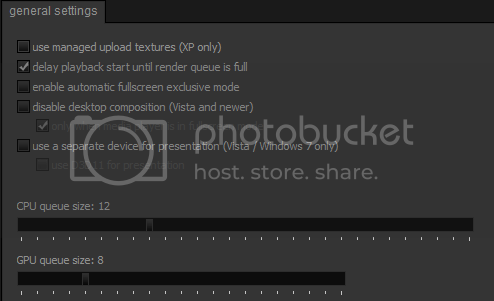 I didn't configure anything, these are default installs with a few settings changed to allow me to take images. I kinda rushed this, I suppose I could try differerent sharpening filters (haven't check it out yet). I'm comparing video decoders not renders or wait I'm sure these are decoders, aren't they? Just woke up so getting kinda confused. And yes you're correct I'm comparing MadVR with EVR custom pres, that's what it says on MPC-HC. At first i tried this guide, so it worked perfectly fine for the first time, then i reinstalled my OS for some reason, after that first time i am constantly getting the problem mentioned above, no matter the changes in settings i do. so i switched on K-Lite codec thinking it will do the trick but i am getting same problem as i was when i was on CCCP. i switched on K-Lite codec thinking it will do the trick but i am getting same problem as i was when i was on CCCP. Don't use K-Lite or CCCP. Remove all your codecs and whatnot, then reboot. Then follow the MPC-HC + madVR guide Zach linked to manually install haali, LAV audio & video, and MPC-HC. Still getting problem i after installing latest MPC-HC and all. Do you have madVR installed? If so, does it run when you play videos (check your filters and look for the madVR icon in your tray). That madVR screenshot looks correct, though I like to leave RealMedia & QuickTime to System Default. Interesting. May I see your Internal and External Filters settings? when i try playing it MPC-HC starts with a Pause and dose not play. Can you show me the madVR's general settings (under rendering), please? without ending process mpc-hc wont open. You can't play audio or video now? Strange. I'm going to be honest here -- I'm not sure why you're having such extensive issues with madVR and MPC-HC. I've checked the obvious stuff, and it's hard to debug anything else the way we have been. Do you want me to try and fix things for you remotely (i.e. with TeamViewer)? If so, shoot me a PM. Otherwise, the only thing I can suggest is to check for conflicts with your installations, and to ensure that your drivers are up to date. As an aside, you've reminded me that I need to update the guide a bit. Thanks! download links were of bit older version..